It’s the second half of 2017 and you better stay ‘woke’ to make the best of it, even as the Season 2 of Quickteller Referrals begins. 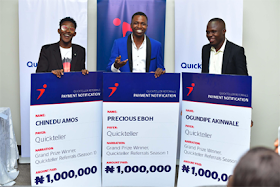 Now, in Season 2, six winners will emerge winning 1 million each within 3 months from July 3rd to October 2nd, 2017. 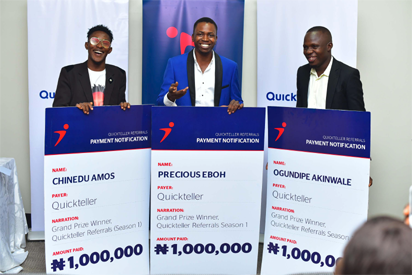 So, here’s how it works: You could literarily get paid, anytime your friends or family use Quickteller for bill payments, fund transfers, airtime recharge, cable or data subscription. Use hardeyshinnah.mo@gmail.com as referral email. • Invite your friends and family using their phone number or email address. • Once they sign up and make a transaction, your phone beeps. Remember, the big deal is the top 6 referrers at the end of the quarter gets 1 million naira each… No raffles, no draws; you refer, you win! To find out more, join the conversation @quickteller on Facebook and Twitter; @quicktellerng on Instagram. 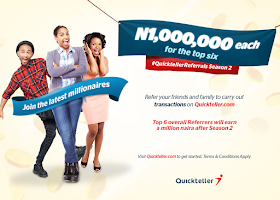 If you’re going to spend it anyway, why not spend it on Quickteller and stand a chance of becoming a millionaire??? Be nice, so tell someone to tell someone.